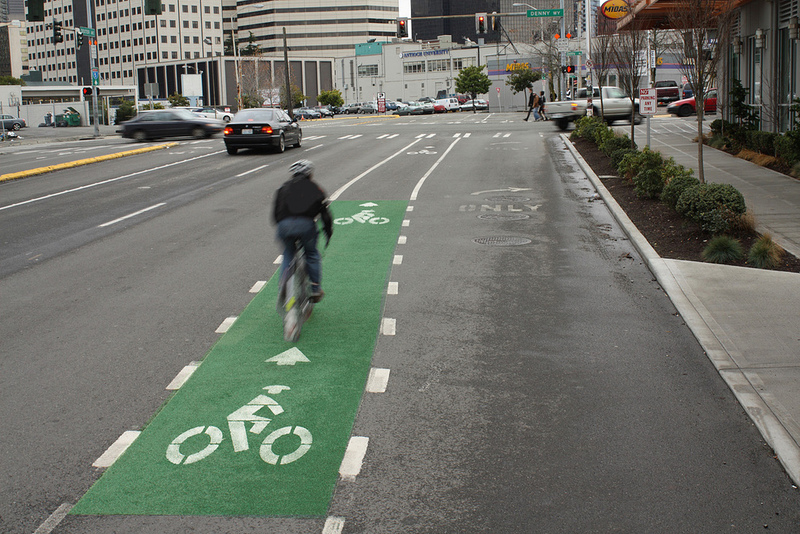 Seattle's many bike lanes helped earn it the title of Top Time-Saving City from Real Simple magazine. Photo by SDOT. Cities have been ranked in all kinds of ways. Best places to live, best access to the outdoors, most walkable, most obese, ease of landing a green job, best street art. Real Simple may just have hit on something…real good. (A similar ranking is Fast Company’s “Fast City” issue, which we highlighted in a previous post.) Planners are accustomed to talking about walkability, bikeability, transportation alternatives, and access to services and amenities as though they are residents’ end goals. And they may be, for some. But in today’s time-crunched society, the ultimate objective for many is saving those precious minutes. Making it to work faster in order to squeeze in one more morning meeting. Grabbing milk at the corner shop so you can spend time with the kids instead of making a special trip to the grocery store. Being able to bike to the office so you can commute and get a workout at the same time. So maybe we should follow Real Simple’s lead and bill progressive transportation and land use measures not just as Smart Growth, or Transit Oriented Development, or livable communities – but as Time Savers. The top ranked city was Seattle, “an icon of urban efficiency.” Real Simple highlighted its extensive public transit system, relatively on-time airport, and 50 miles of new bike lanes in the last two years. The city also has more Wi- Fi hot spots and coffee shops than any other U.S. city, and a state-of-the-art signal-optimization program which synchronizes hundreds of traffic lights and allows smoother travel through the city. Portland, Ore. came in at number two, with its bike infrastructure, light rail system, speedy emergency services and 450 gourmet food carts. San Francisco, Calif. was ranked third. The city ties Seattle for the most booksellers per capita, offers tons of takeout options, and has advanced telephone and online services providing updates on biking, transit and traffic conditions. Fourth is Boston, Mass.. The first East Coast representative has a compact layout and the nation’s highest walk-to-work rate. It also boasts single-stream recycling pickup, plenty of farmers’ markets, and smart apps like Boston’s Citizens Connect, which allows residents to report problems and submit photos from their iPhones. Rounding out the top five Time-Saving Cities is Minneapolis, Minn., number one in America for farmers’ markets and number two for bike accessibility. The city also has one of the highest numbers of community gardens per capita, a citywide wireless network, and a text messaging system for distributing snow emergency alerts. To read about the rest of the Top 21, visit Real Simple.